I vow not to be the crazy woman running around in search of one last trimming. This year I’m going to treat holiday shopping as a military exercise — stealth and efficient, every manouver carefully plotted in advance. The plan of attack? To get in, get the gifts, and get out with minimal collateral damage. How? It’s all in the planning. This chart will keep track of gift ideas as they come up. It’s the Thornbury Holiday Wish List. 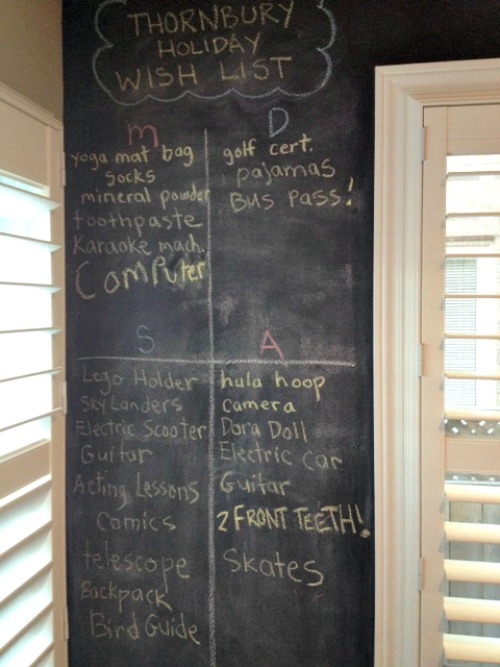 We have a chalkboard wall in the kitchen which makes a handy list area. It’s also easy to erase. Notice how there are now only two gift receivers listed? 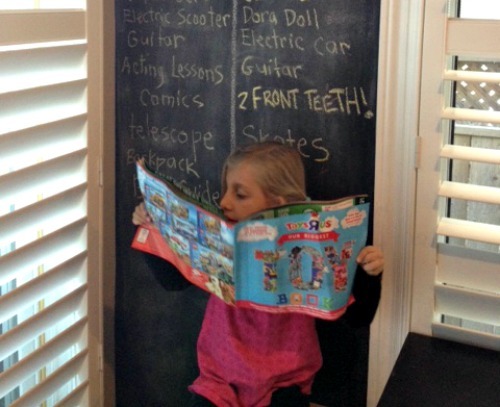 “Somebody” wiped her parents off the board and then scribbled over their wishes. Clearly this child is under the impression that holidays are all about the kids. And yes my list is lame. I can’t help it, I’m practical. Most of my socks have holes and we happen to be nearly out of tooth paste. So why not include them in the stocking stuffers? Also, I’m nearly out of deodorant…. My son added “Computer” to my list. What a doll. Wait a minute. If I get a new computer, he gets my old one! Sneaky bugger. He also added “2 Front Teeth” to his gummy sister’s list. Bah ha! And look at my man’s list. A golf gift certificate and pajamas? The guy really doesn’t require much. Maybe if he’s really good I’ll get him some mouthwash and some rechargeable batteries. Ahem, I may have added “Bus Pass.” A few weeks ago his car was shmushed in an accident. Thankfully nobody was hurt, but poor “Goldie” his ever faithful station wagon didn’t survive. I suggested we put the insurance money towards my new computer and he can take the bus to work. What? I’m getting a lump of coal in my stocking, aren’t I? ….I’m pre-shopping online; price checking between stores, checking availability and looking for coupons (don’t forget Fisher-Price is offering up to $90 in coupon savings, but you can only get them online until November 30th). The days of casually strolling through the mall, sipping a peppermint latte while browsing and leisurely selecting gifts are over. I’m on a mission this holiday season!